Quartz cuckoo clocks are a little bit different. These clocks are battery operated. They still have the look of a traditional cuckoo clock, but the weights are just for aesthetics. Regardless of which type of clock you choose, there is often a shut-off switch in case you don't want to listen to all cuckoo calls all night long. Our handcrafted wooden cuckoo clocks, whether they are a traditional weight mechanism or quartz, can be a beautiful and fun way to keep time in your home. 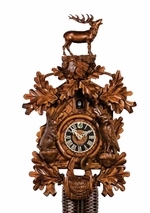 My Cuckoo Clocks offer large selection of imported German quartz cuckoo clocks. Browse through our quartz cuckoo clocks and bring one home today. Quartz is the heart of every modern timekeeping device, from digital wristwatches to full cuckoo clocks. Inside a 1-day quartz clock is a quartz crystal tuning fork that has the same function as a pendulum�providing resonant motion. Through various gears and elements, the resonant motion of the vibrating quartz crystal translates into precise timekeeping. Quartz is also physically, mechanically, and chemically stable, ensuring that your 1-day or 8-day quartz clock is accurate throughout its longevity. My Cuckoo Clocks is home to a variety of quartz day clocks that exemplify creativity and craftsmanship mixed with modern innovation. The handcrafted wood is combined with various tunes, cuckoo calls, and animations for a vibrant experience at every hour or half-hour. Shop our store now and contact us if you have any questions about our products.